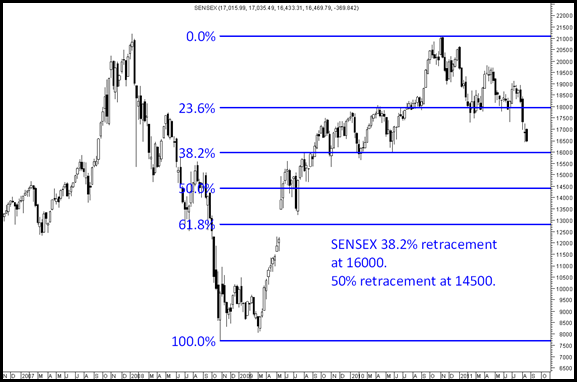 Sensex – 38.2% retracement comes to around 16000 levels. 50% retracement at 14500. Technical Breakdown below 17500 gives a target of 15500. So we are soon getting into a zone where we can see recovery. Metals like Sterlite, Tata Steel could give sharp rallies avoid shorting them from here. 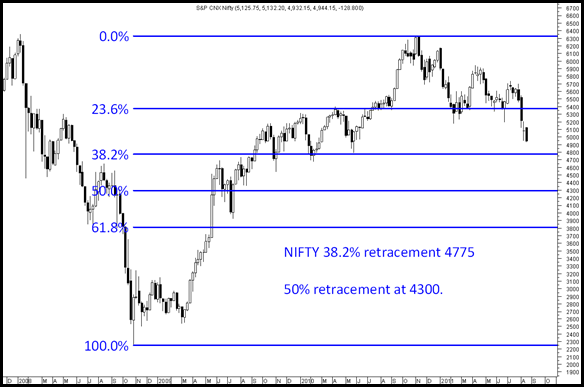 Nifty – 38.2 % retracement levels come at 4775 and 50% at 4300. 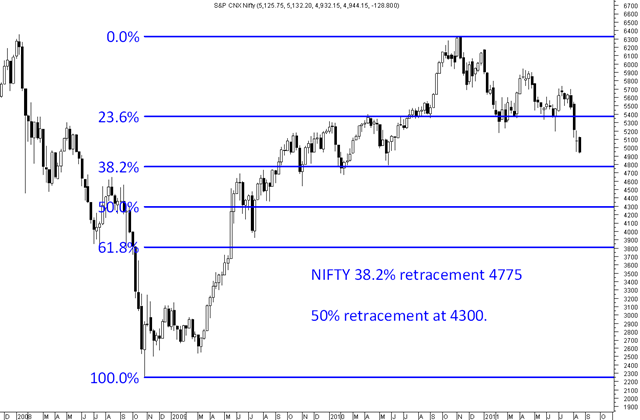 Technical downside targets come at 4700 for the breakdown below 5200-5300. Again getting into a zone of short term pullback. RSI will get into highly over sold and almost comparable to 2008 falls on any further cracks. Small buying can be done selectively at current levels with medium term view. #Smallcap Indices in All Time Highs and Outperforming Nifty!! Time to be Cautious and Selective !! Nifty Golden Cross – Does it Work ? 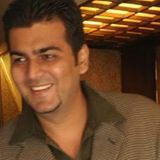 Hi Nooresh, Its Gaurav. Hope you are doing fine!! !I have built a portfolio of 4.5Lacs in last one year (June 2010 onwards). Right now the market value is around 3Lacs. I want to put 2 to 3 lacs more in next 15 to 30 days. Do you think its right time to invest money or do u see significant downside in next 3 to 4 months. The new stocks which i’m intersted in are Hanung Toys, Canara Bank, Prakash Industries, HDIL, Venkys Chicken and IRB Infra. Pls suggest. 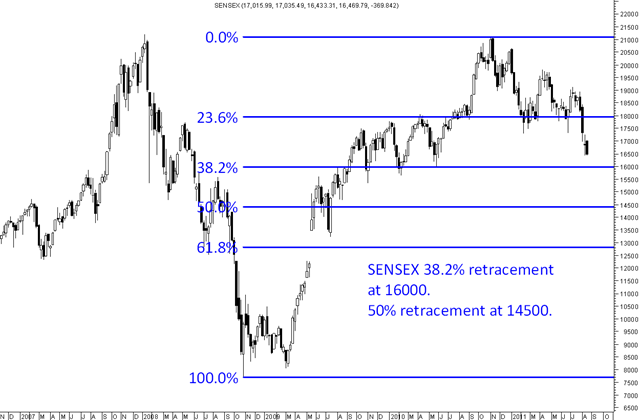 Well go structured slow and steady with a view to be ready to see 15000-15500 on Sensex. Out of the stocks you have suggested all of them are high risk. I would suggest you add Aditya Birla Nuvo and Godrej Inds into the list. Prakash Inds the company has not kept any of the project timelines and i have been skeptical for last few quarters else the potential is huge but no delivery. any recommendation on your prvious fevs like Bengal Assam, it is back to where it started last year same time, also Bombay burmah, JK Agri/Kaveri Seeds (this is doing well). Can i buy mirc again. at 16rs. The fundamental stance on Bengal and Assam remains the same – very strong but price action is not seen yet and we may never know when the market starts pricing it. As of now staying cautious as Index has still not shown signs of bottoming out. It can see a temporary base at 15000-15500 and 4500-4700 ideally or even before that. The trend has been broken so it is now more about time based correction.